Blurg, Sunday night again. This weekend went by too fast! I jumped out of bed early this morning to enjoy coffee and a smoothie before dashing out on a 6-mile run. And just wow, the weather was perfect for it! Sunny, in the 50s, no wind, and not a cloud in the sky. Good thing I got my exercise this morning, because 3 chihuahuas were determined to not let me off the couch today. I’ve been having fun diving into my stash of vegan recipe books lately and grabbed Veganomicon to find a dinner recipe for tonight. 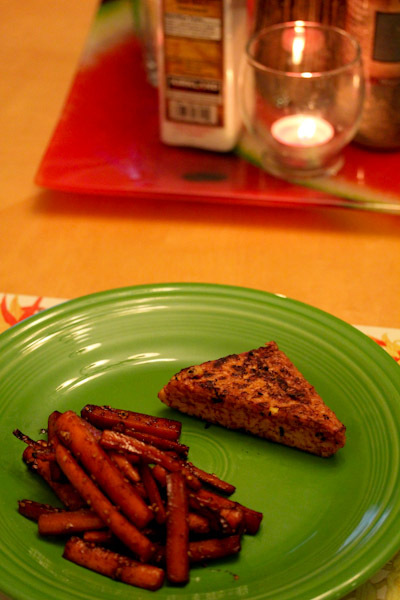 I ended up going with the spicy tempeh recipe since I had all the ingredients and it sounded wonderful. But the recipe was a little time consuming and tricky, definitely not a weeknight recipe because it required boiling tempeh “steaks” before marinading them in the fridge for at least an hour. 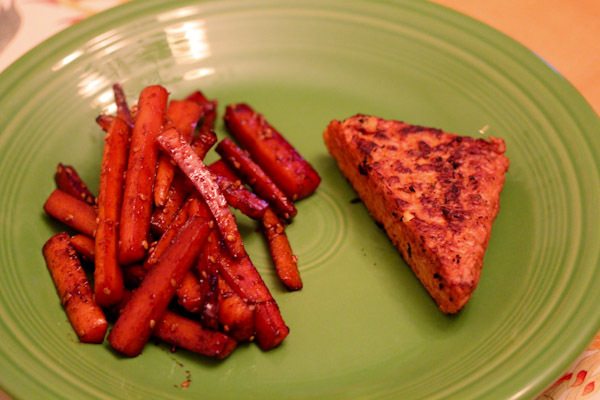 I didn’t mind on a leisurely Sunday evening and it would be my first time trying tempeh boiled. Plus the marinade looked very intriguing with hot sauce and wine in it. 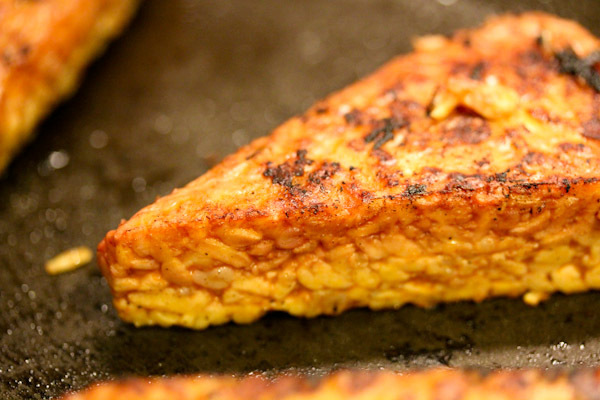 After marinating, I pan fried the tempeh over high heat for about 5 minutes a side. And noticed the tempeh started looking like fish fillets to me with a slight char on the outside. 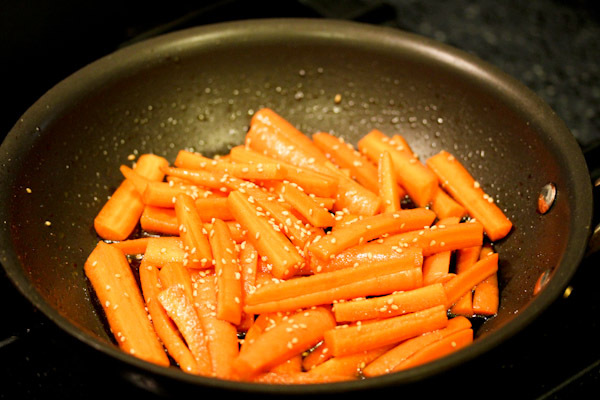 I sauteed some chopped carrots in a little soy sauce, garlic power, agave nector, and sesame seeds for a quick side to go with the tempeh. And while my dinner plate looked simple, it smelled wonderful. 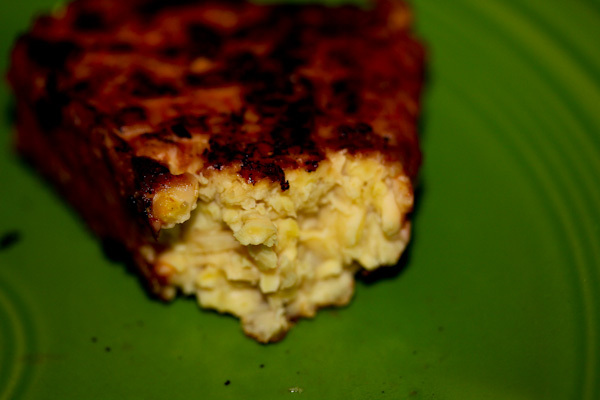 The tempeh was excellent, the fillets had a nice flavorful, crisp, and blackened exterior, while the inside was very nutty and moist. And the marinade added a nice little spicy kick that paired well with the nutty tempeh flavor, but was not strong enough to set my mouth on fire. It’s been a long time since I’ve had fish going back to my pre-vegan days, but this reminded me a lot of a pan fried mahi mahi steak I had once in the flavor and texture. It was a little eerie, but this dish could make a great, cheaper substitute to actual fish maybe. Thumbs up for the recipe, I would make it again and am looking forward to crumpling the leftovers on a salad. 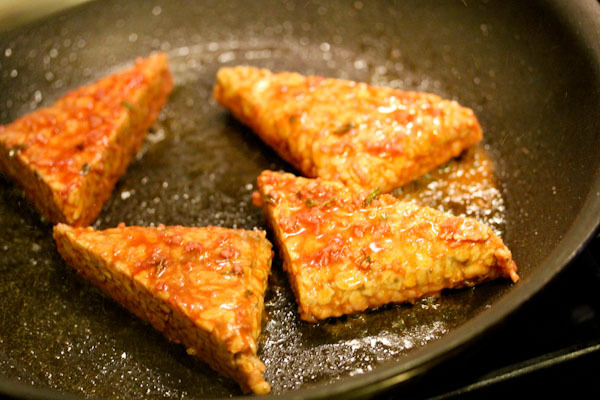 I like Tempeh but always struggle to cook it….this spicy recipe is very intriguing; guess I’ll have to grab that Veganominom book soon! It’s a great book, so many recipes that it’s a little overwhelming.